We arrived to Moscow and only had 24 hours to explore this ancient city, where Muscovites are building on the strengths of their past, as they create their future. Fortunately we had arranged to stay at the Four Seasons Hotel in Moscow situated just outside of Red Square and next to the Kremlin. It’s an ideal location to visit the main sites in the city, and a perfect place to start a tour. The Four Seasons team greeted us with a warm welcome and helped organize our tours. 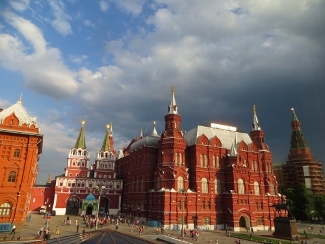 We began at the Kremlin and finished our tour at Red Square – here are the highlights. 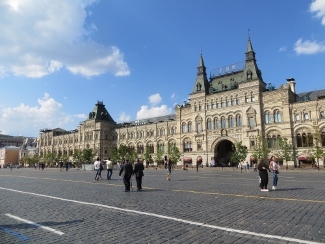 Red Square is Moscow’s historic square, located next to the Kremlin, where everything happens from military parades, rock concerts to fashion shows. 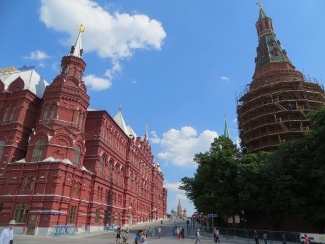 The two most famous sights to see in Moscow are here – St. Basil’s Cathedral and the Lenin Tomb, but you’ll also find “Kilometer Zero”, and GUM. 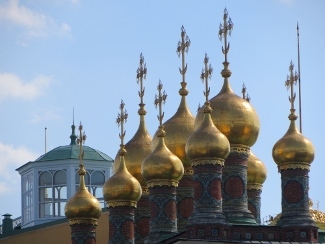 One of the iconic symbols for Russia is this colorful onion domed cathedral built 1561. Commissioned by Ivan the Terrible. This cathedral has several chapels with lovely interiors. 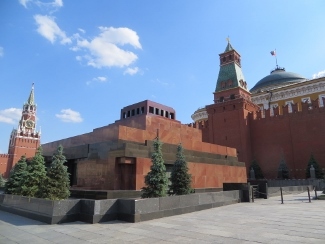 The Lenin tomb is in an enclosed building where visitors view Lenin’s embalmed body. Leaders view the military parades in Red Square from the rooftop terrace on Lenin’s Mausoleum. 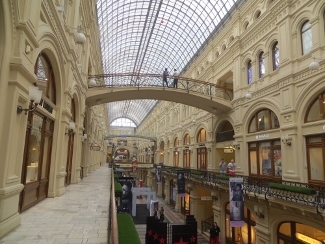 The modern GUM Shopping Mall is located on the east side of Red Square, with three levels of shops, including several designer boutiques. 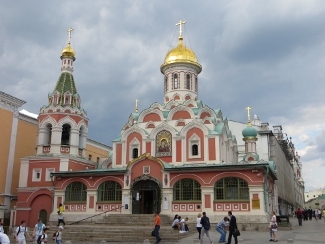 This is a fun stop during your Moscow Travel. Look for the brass plaque on the ground in front of the Red Square south gates, where all distances in Russia are measured. An absolute must as you travel through Moscow! Kremlin means “fortress”–built in the 13th century. Its walls are 3 1/2 to 6 meters wide with tunnels built during the Soviet era. There are 19 towers within the Kremlin walls. Within the walls, there are palaces, cathedrals, and Official Residence of the Russian President. 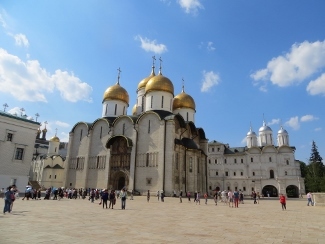 Inside the Kremlin, we were allowed to visit the Dormition Cathedral of Moscow, and walk the grounds. 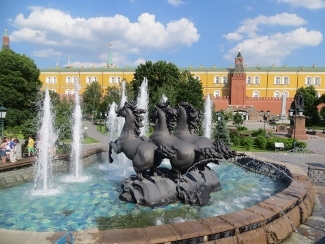 Visitors can tour the State Armoury, a collection of weaponry, treasures, ceremonial carriages, thrones, Catherine the Great’s wedding dress, and the Orlov diamond. 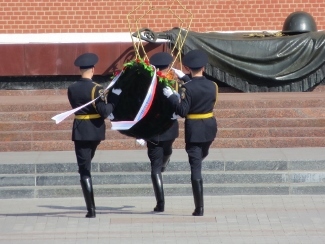 Eternal flame and Changing of the Guards: We watched soldiers place wreath on tomb of Unknown Soldier. In first 4 years of WWII 27 million people died–every family in Russia was affected. Today, this lovely garden is a place where locals gather to rest and play, and even shop at a new mall next door. This museum has over 600,000 pieces of art, with a fine collection of Impressionist, Post-Impressionist and Modern Art. 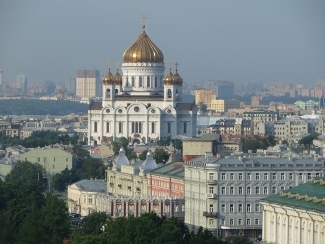 This cathedral is gigantic and considered the main church of Russia. Our guide said that up to 10,000 people can fit inside. It’s a well-known landmark in Moscow with incredible views of the city from its terrace. The metro stations are architecturally and artistically beautiful! We visited one station, and wish we had time to take the “ring” road circuit to see more of the metro stations. Each station is unique, some with sculptures, mosaics, stained glass panels. In the 1940’s, Stalin designed 7 skyscrapers to represent victories that led to a new Soviet era. These buildings are known as the “Seven Sisters” and can be seen throughout the city skyline. 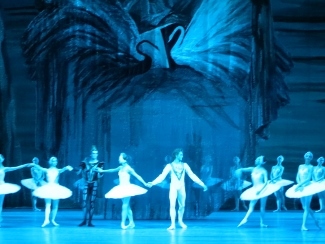 Moscow is home to one of the oldest ballet companies in the world. 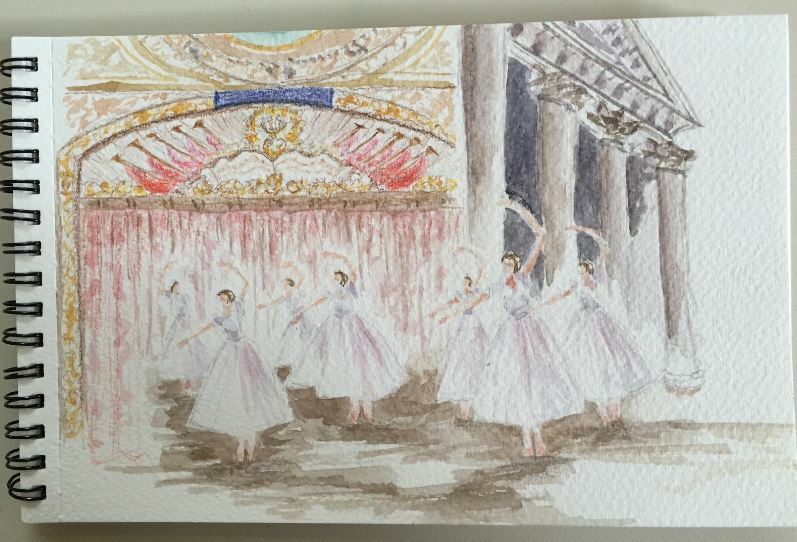 The Bolshoi’s renovation was recently completed (1.8 billion USD), and we were able to get main floor tickets to see opening night of Tchaikovsky’s Swan Lake. 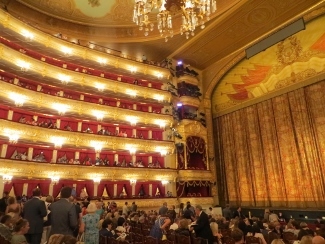 Theater is like a huge 6-level palace with a live orchestra. The theater was packed for this performance. It is a masterpiece–enduring decades. A thrill to experience. 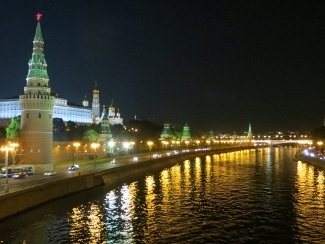 We walked across the famous bridge over the Moscow River, where you can see the towers and wall surrounding the Kremlin. Lastly on our list of Moscow Travel Musts– Dinner at Four Seasons Moscow: We enjoyed dinner at Moscow’s finest Italian restaurant – Quadrum. 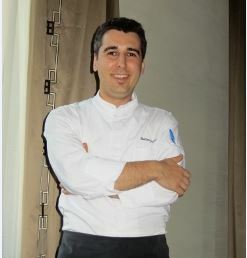 Executive Sous-Chef Matteo Guida presented flavorful dishes of homemade pasta with beautiful presentation. 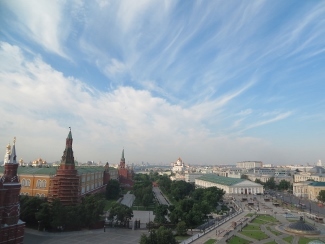 The views from the restaurant are the best in Moscow, looking directly out to Red Square. Our next trip, we want to see more Moscow highlights including the Tretyakov Gallery, the New Maidens Convent (UNESCO), Victory Park, Sparrow Hills for panoramic views of the city, Arch of Triumph, the President Motorcade Avenue, former KGB headquarters, Lubyanka Square, Russian White House, Tolstoy, Dostoevsky, Peter the Great Monuments. We felt much while in Russia–for its people, for its history, for its future. It was a truly singular experience. Global Adventuress would like to thank the Four Seasons Moscow for hosting us and organizing our tours with a local guide and drivers. We also would thank Travelpro for the carry-on spinner suitcase, a favorite of travel crews and avid travelers, as well as DK Travel for the Top 10 Moscow travel guide. Seabourn Seabourn is a fabulous luxury cruise line that cruises through the Baltic and Scandinavia regions, as well as worldwide. 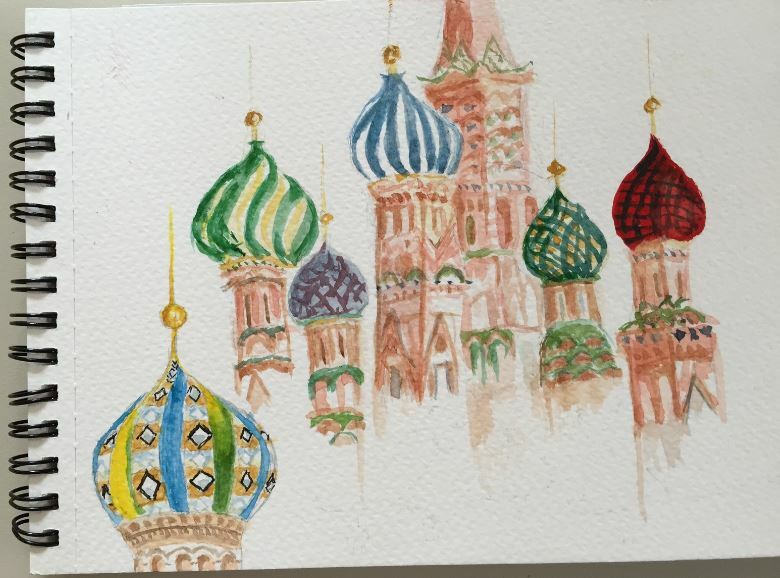 RWTI: Applying for a Russian visa can be overwhelming, so we recommend contacting Rainier Travel to help prepare your visa paperwork and vouchers. They helped us expedite the process.